The Wedding Bouquet – Toss it or Keep it? 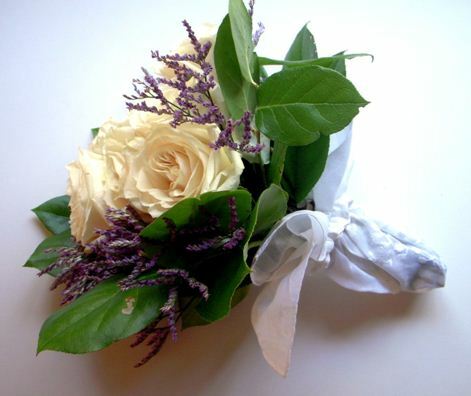 Home » All Blog Posts » The Wedding Bouquet – Toss it or Keep it? Ok, I’m being a bit facetious here because I’m not referring to the traditional bouquet toss, but rather to the current trend in bridal bouquets which makes me want to toss them to the curb. 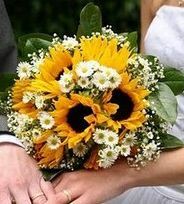 Rather than compliment the bride, today’s bouquets often make her look like she just breezed in from the farmer’s market. Of course styles and fashions constantly change, even when it comes to something as time-honored and traditional as a wedding dress. If you view this here you will understand what I mean! 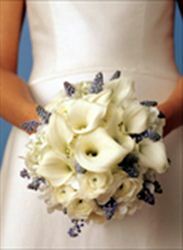 Bouquets used to consist of a cascade of flowers. The arrangement was formal and refined. Then in the 1970’s Age of Aquarius, things relaxed. Suits replaced tuxedos. It’s a lot different these days, now that the groom can now rent a suit for my wedding! This would not have been a possibility back in the day. 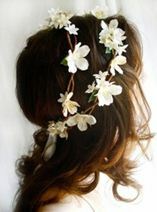 And for the bride, garlands of flowers were often worn instead of the traditional veil. 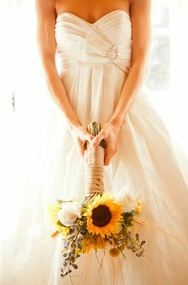 Bouquet styles shifted from formal and “arranged” to bucolic and pastoral. They appeared as if the groom had just returned from a walk in the garden to present his beloved with a “just picked” bouquet for her special day. Soon country bouquets became the norm, and somehow transformed into something so long stemmed they belonged in a vase, rather than in the delicate hands of a bride. Some resembled a club of broccoli, others brought to mind the bandaged leg of an injured dog. It is not my intent to offend or cause hurt feelings to any bride. 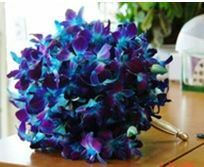 I raise the issue of the “broccoli bouquet” because from what I’ve observed, it appears many brides are unaware of the overall visual impact of some bouquets. Many brides spend more time, care and attention on the wedding than they do on any other event in their lives, right down to minutia such as what earrings their attendants will wear. One bride confessed “I knew more details about my wedding than I did about the house we bought or what was in my retirement portfolio” – two issues which could have lifetime consequences on her future, while the actual wedding would consume only a day of her life. 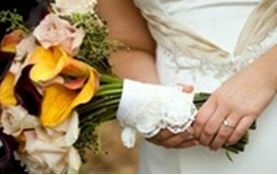 With that in mind, I’m here to point out a few pitfalls that can occur when choosing a bouquet – and offer some solutions. If stems can fill a tall vase, then they constitute a floral arrangement, not a feminine bouquet. Where is your eye focused? 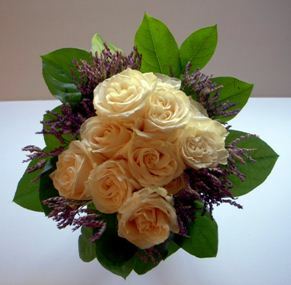 A lovely, soft, feminine bouquet trailing an anchor of dirty stems. Bouquets resting on the piano at the reception look like someone just pulled them from a bucket at the flower mart. The visual impact of the stems far outweighs the beauty of the flowers. 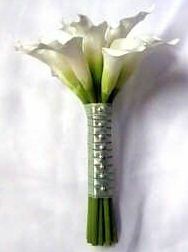 This bridal party carries short, unobtrusive stems, with ribbon streamers for softness. 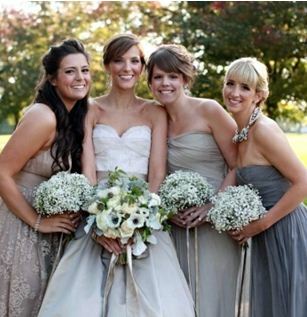 The bouquets reflect the softness and beauty of the bride and her attendants. 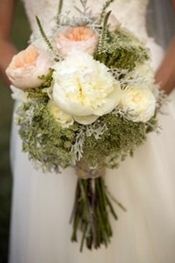 Compare them to second wedding party with similar color palette where the stems are more prominent than the flowers. 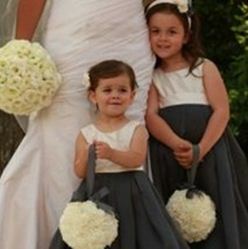 (faces cropped for anonymity) Which of the two weddings fees more feminine, soft and beautiful? 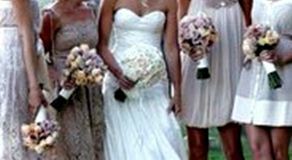 Let’s look at some ladies who got it right – brides who understood that the purpose of the bouquet is to enhance the bride, not compete with or detract from her. 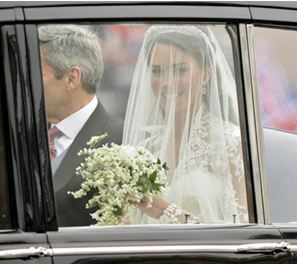 Kate Middleton was right on target in the bouquet department. 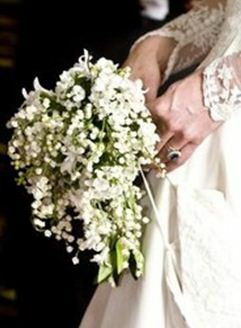 Her charming arrangement of Lily of the Valley, Sweet William, Hyacinth and Myrtle complement the overall image of a beautiful bride, flushed with anticipation, in a jaw dropping gown. The flowers neither upstage nor detract from the total effect. What do you remember from her wedding day? Her remarkable gown and her radiant smile. 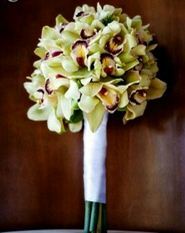 The bouquet didn’t make a statement on its own; but rather served as an accent to support the image of fresh and feminine. 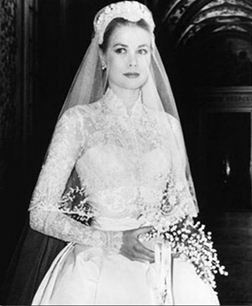 Princess Grace’s small accent bouquet resting on her prayer book left all eyes focused on the bride (and her tiny waist!) 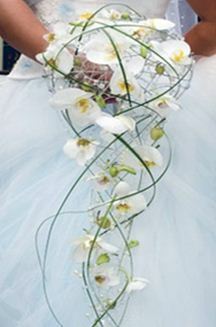 In addition, the spray arrangement of Lily of the Valley added to the delicate effect created by the lace veil and dress. Everything said soft, serene and beautiful. 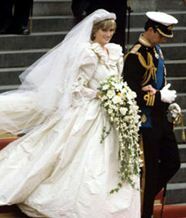 Princess Diana’s cascading bouquet may have seemed a bit over the top. David and Elizabeth Emanuel, who designed her gown, requested a bouquet in proportion to her dress. (The train alone was 25 feet long.) The flowers comprised a cascade 42”long. Someone asked how much Diana’s bouquet weighed. It was between 2-3 kilos, or less than half a pound. I once visited the Chelsea Flower Show where a replica of Diana’s bouquet was on display. Although voluminous, it appeared surprisingly light and airy. Dramatic yes, weighty, no. Note how she effortlessly she holds it with one hand, while her other hand is draped through the arm of her prince. Incongruously paired with a sophisticated gown, this bouquet screams “Mom’s home from the farmer’s market. Someone help her unload the groceries.” There is nothing delicate about 15 inches of stems Phallic, yes; feminine, no. 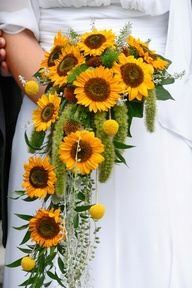 A less elaborate arrangement with country sunflowers and tiny daisies, and not a stem in sight. Perhaps in choosing an informal bouquet, some brides hoped to emulate the romantic 1996 wedding of Carolyn Bessette Kennedy, which took place in a small chapel in Cumberland Island, GA. In this instance, her “just picked” garden bouquet perfectly complemented her sleek and simple dress and hair style, as well as the country venue. Note the leaf strewn wooden steps as well as the rustic setting. An elaborate formal bouquet would have been out of place. This country bouquet is in proportion, and the stems are not overly intrusive Had they been wrapped (in a handkerchief) it would have enhanced her sleek silhouette even further. 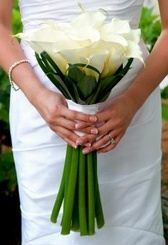 You may think a large bunch of stems is needed to securely hold a bouquet together. Not so. These little angles will have a much easier time looping a single ribbon over their tiny wrists, rather than trying to wield a club of broccoli. One of my absolute favorite arrangements is this bouquet of flowing tendrils entwined with a waterfall of orchids, conveying an overall impression of both feminine and fabulous. Your eye follows the flowers and focuses on the bride and her gown – and isn’t that the point? 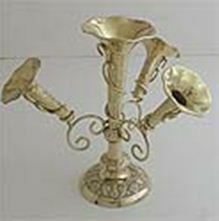 There are even wedding epergnes available to hold all the bridesmaids bouquets at the reception. If you insist on the broccoli bouquet, take a tip from the pros and wrap the stems – hopefully in a beautiful handkerchief! Because stems can “weep” once they’re cut, a cotton handkerchief will absorb moisture and prevent stains more effectively than a strip of ribbon. 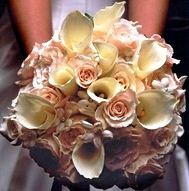 Whether the bouquet is formal or informal, with the stems camouflaged, your attention is focused on the beauty of the flowers and the bride. a hankie will provide not only a treasured keepsake, but something comfortable “to have and to hold” pun intended, while the bride makes her way down the aisle, as well as keeping focus where it belongs – on her. Here is a bouquet a friend made for her sister. The leaves are from something both sisters planted with their father when they were little girls. 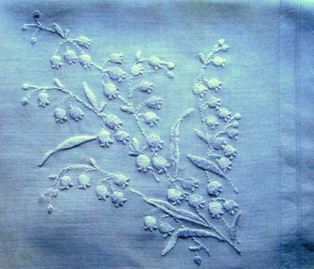 The bride chose a handkerchief embroidered with lily of the valley to wrap the stems. Did you catch our trick? We used a hair scrunchie to secure the hankie. In fact, with the hankie properly folded, one soft white scrunchie did the trick. 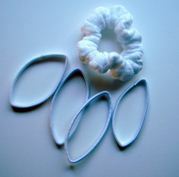 The other elastics were used to wrap the stems before the hankie was added. 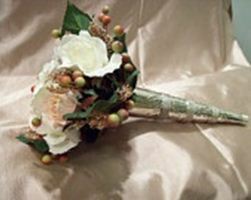 When stems are wrapped, often floral pins are used to anchor the ribbon. In fact, stems and pins have become a design element. One last time – the stems are not the focus, the FLOWERS are. Check out this clarinet in bloom. 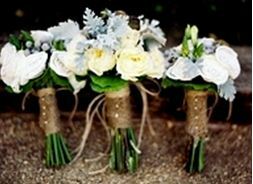 Could a row of pins outshine the lovely calla lilies? The can, and did. I guess I’m just not clear how bunching all these flowers together in a topknot enhances the beauty of the flowers or the bride. I understand a burlap wrap if it’s a country wedding, but again, the stems overwhelm than the flowers, not to mention the lethal row of pins. 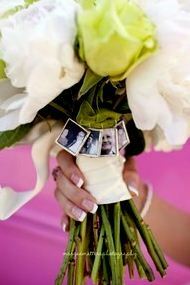 Along the lines of sentimentality – heirloom hankie, family photos, etc., this bouquet added small pictures of those who could not attend. It’s a charming sentiment and lovely idea, but where is your eye focused? On the sweet photos, or that massive hunk of stems? I realize the photos are probably for only the bride to see, but the whole congregation will get a gander at those unsightly stems. 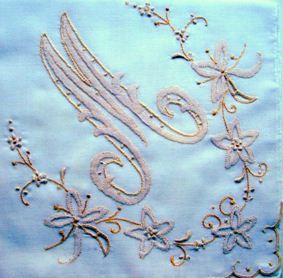 Many brides carry a hankie in order to catch a stray tear or two. 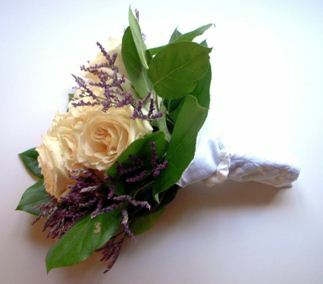 Had this bride allowed a hankie to dangle from her bouquet, the stems would have been camouflaged and become incidental. If you’ve ever seen the show “Say Yes to the Dress” where women select their bridal gown, when the bride finds the right dress, her entire demeanor changes. She can’t stop smiling and often sheds a tear or two, exclaiming “I feel so beautiful.” There is nothing lovelier than a woman in love, and when she’s joining her beloved on their special day, she literally glows. Confucius reminds us “Everything has beauty, but not everyone sees it.” Let everyone see just how beautiful and in love you are, with nothing to detract from the image you present. Let you bouquet enhance your beauty. I truly loved your insight on the benefits of the best bouquet for the right gown that does not draw more attention than on the bride and her gown. I think brides would benefit from a book or magazine that would help them to choose all of the proper details that would enhance their choices in floral bouquets. 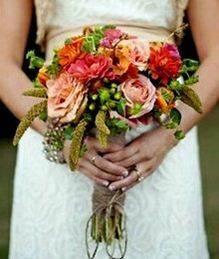 Having a great florist with the education of matching the right bouquet to the right dress would really take a lot of stress from the bride. 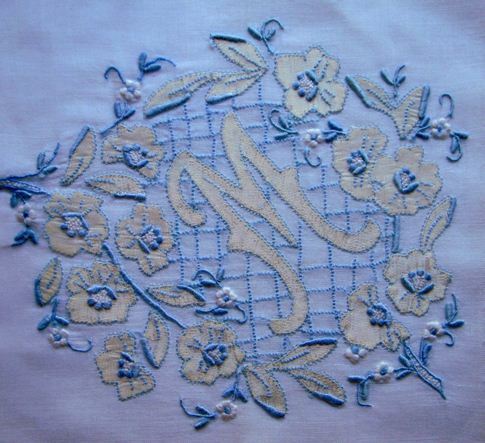 Also adding a lovely handkerchief to the bouquet really tops if off with an elegance. When we think of the choices you emphasized in your blog you were right on, the focus should be on the bride, the flowers should only be an accent to her glowing beauty! Loved this review. Just chose my bridal bouquet and having seen your picture comparison i’m glad I have no stems because you’re right..all you look at are the STEMS. 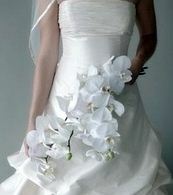 My only question is if you have a cascading bouquet like the waterfall of orchids..would you still do the traditional toss to the the wedding party? I have attended weddings where a “major” bouquet, which would probably be destroyed in a toss was saved by a member of the wedding party to enjoy. In it’s place, a smaller “token” bouquet was used for the toss.